Rev it up and ride fearless. Onslaught™ rides smooth and delivers more power than you'll ever need. Tackle trails – and to-do lists. 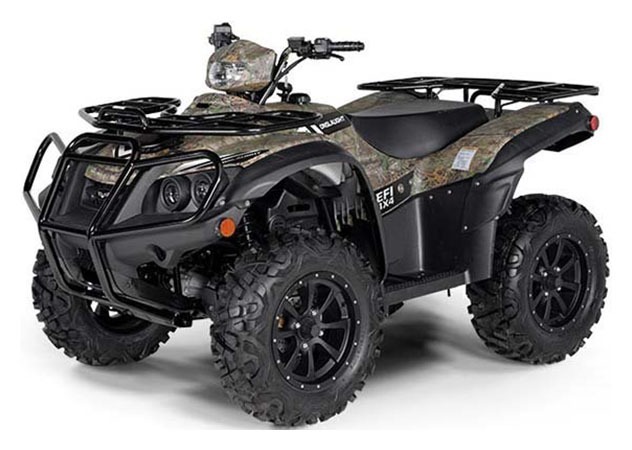 Our Onslaught™ 550 ATV gives you plenty of power, and an EFI engine that knows how to make the most of it. POWER: Onslaught brings more than enough power with a liquid-cooled 503cc engine featuring electronic fuel injection. SUSPENSION AND HANDLING: Electronic Power Steering and four-wheel double A-arm suspension give you total command and comfort. RELIABILITY: Onslaught is backed with an unsurpassed 1 year warranty. FOUR-WHEEL DOUBLE A-ARM SUSPENSION: Onslaught makes every ride a smooth one with its precision-tuned, four-wheel, double A-Arm suspension. From springs to shocks, our suspension system effortlessly conquers challenging terrain. ELECTRONIC POWER STEERING (EPS): The power doesn't have to stop at the engine. Take command with an Onslaught EPS model and get the easiest, most responsive steering available. BEST-IN-CLASS 12 IN. GROUND CLEARANCE: Onslaught clears obstacles before they ever become a problem, with more ground clearance than anything else in its class.